The Christ in Prophecy Journal: Christian Doctrine: How Does Drift Occur? What are some historical examples of doctrinal drift? How does it happen, and how has it happened in history? 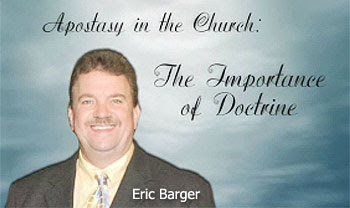 Eric Barger: The very Reformation of the 1500's and 1600's was about coming back to pure doctrine, coming back to the truth and away from the man-made Catholic teachings that had gripped the Church for hundreds of years. We can clearly see doctrinal drift as the mainline denominations who were once the great evangelicals of their day say 150 years ago begin to slide away. They weren't called evangelicals at the time, but that was what they were by the standards that we today understand that word to mean. We watch them. The first step in their slide was when they decided not to talk out about social issues anymore and become exclusive. They began to abandon the social issues that the Scripture speaks to that effect people, and so lost their witness in society. They gave up on those things. We have all kinds of examples of how this has taken place. The mainline denominations next accepted a form of skeptical scholasticism so that by the time it was all said and done in many mainline denominations and seminaries the Bible is not even taught as being really true. For example, they'll say the first five books of the Old Testament were written by four different individuals. That was Julius Wellhausen a heretic from 100 years ago who came up with the idea of the JEPD Theory, claiming that the first five books of the Old Testament were written by different individuals and not by Moses. The skeptics then began to attack the validity of the miracles recorded in both the Old and New Testament. With the Bible so deflated, pretty soon we ended up with a totally different version of Christianity than what it historically has been. Even though it is still called Christian, it doesn't have much to do with the faith. As a counter-reaction to scholasticism and exclusivity, we saw the pendulum swing way left over to mysticism, though keeping its denial of the Bible as inerrant and authoritative. In our generation we've watched this take place, and now today with the Emergent Church Movement and with so called modern-liberalism and the post-modern society we are seeing what I call a "satanic redo" of what took place in the Middle Ages with mysticism. Again and again throughout history we've recorded this slide into doctrinal drift taking place. What we need today is a reformation inside evangelical churches that will bring us back to the Word of God. We must want to follow what God's Word has to say. Dr. Reagan: Only 150 years ago England was the center of world Christianity. The were sending out missionaries all over the world and translating the Bible. Most of the hymns that we have in our books were written by their pastors. Well, today, 7% of the people in England go to church, and most of those are apostate churches. Nathan Jones: Southern Baptist Theological Seminary where I went to is a great example of a return back to the faith. I wasn't there during the 70's, but supposedly their doctrine had gone really south. Enter the new millennium when I was there, and the seminary is producing some of the best doctrinally sound churches out there today because of the revitalization that Al Mohler brought to the school and denomination. So, there is hope. Dr. Reagan: Speaking of schools, ones that have totally lost their faith are Harvard, Yale and Princeton. All of these universities were originally founded as Christian universities. In fact, just go back and look at their founding documents and they'll say that the purpose of their university was to bring people to Jesus Christ and prepare them to go out and share the Gospel. Today, they are utterly pagan, secular universities. Eric Barger: They really are. Those were the standards for theological institutions in America, and we all see what's happened here. So, if anybody thinks it couldn't happen to you and your church, or your denomination, realize it can and can happen fast. Nathan Jones: How does this happen? How can you teach the Bible and sound doctrine one day and then the next day you are not? Eric Barger: If leaders are not holding the Word of God up as authority, believing and teaching it faithfully, then those who listen to them will also begin to do the same. Nathan Jones: So, you believe it's the leaders then who are dropping the ball? Eric Barger: There is a progression that took place, I believe. The drift first began with the leadership of the denominations, and then it trickled down into the pulpits, and then finally was accepted in the pews. In the next part of this series on the importance of Christian doctrine, we'll ask Eric how a Christian can be discerning about doctrine. What's so scary about the loss of doctrine is that it keeps getting weaker and weaker. Like a reused tea bag. What will be the final outcome as even this weakened doctrine is discarded? It's truly a lose-lose scenario. Jesus is at the door knocking to be let back into His Church. How sad! God help us all for what is to come upon the world. Much love in Christ and God Bless! Be stong in Christ and have courage. "...Like a reused tea bag". What do you think that Albert Mohler thinks about the toot your own horn discernmentalists?